Russian models in 3D printed lingerie and geopolitics wouldn’t seem to be a natural match. Not at first glance, anyway. But new technology blends data with manufacturing to form new market possibilities. Today there are about a dozen 3D printing companies in Moscow, where the industry, like elsewhere, remains in its infancy. Moscow Times details how one company, 3DPrintus, printed underwear after Russia’s Parliament banned underwear made of synthetic lace. The ban is not sanctions-related. But the prospect of 3D printing in Russia raises the question of whether it can or will be used to get around shortages of specific goods caused by economic retaliations for Russian actions in Eastern Ukraine. Theoretically, Russia could use 3D printing to create certain manufactured goods they can no longer import. 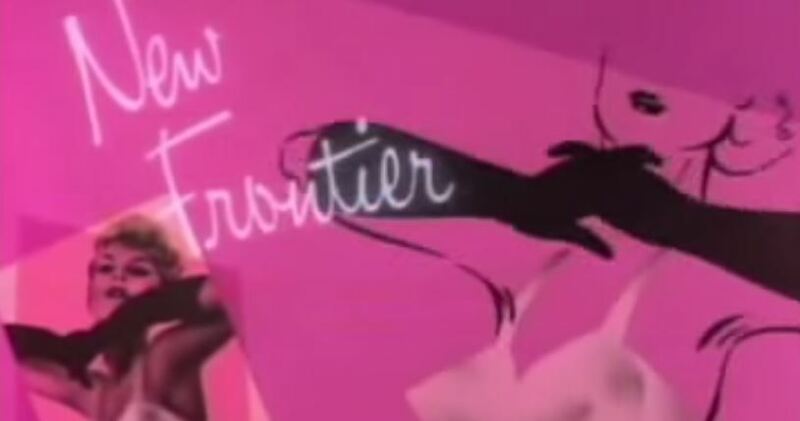 Underwear and geopolitics- a still from Donald Fagen’s New Frontier video. One of the reasons this is interesting to watch is because these sorts of constraints and imperatives are the type of catalyst that can help industries take a step forward. Such situations are often caused by wars, or in this case, a kind of low-fever Cold War. Right now, governments, makers and businesses are interested in 3D printing. But what 3D printing’s crucial application will be remains a mystery. There is no way, of course, to guess how rockets might have developed, or failed to, were it not for the fact that, during the 1940s, the world’s most technically sophisticated nation was under the absolute control of a crazy dictator who decreed that vast physical and intellectual resources should be hurled into the project of creating rockets of hitherto unimagined size. These rockets, which were known as V-2s, were worse than useless from a military standpoint, in the sense that the same resources would have produced a much greater effect had they been devoted instead to the production of U-boats or Messerschmitts. In other words, it’s not just the technology and science – it’s the external driver that causes a new technology to be taken up. In the case of rockets, it was Hitler’s government’s zeal for the technology in the 1930s and 1940s. Today, the growing East-West political split may play a similar role. And here 3Dprinting comes to mind, and not simply with Russia, either. 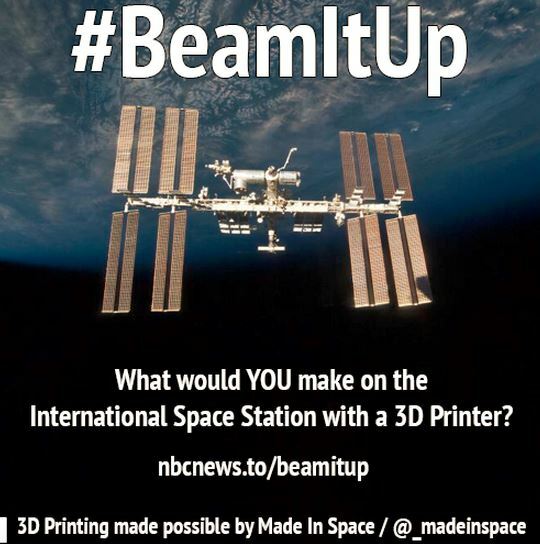 Made In Space is the company behind 3Dprinting on the ISS. Vladimir Putin has repeatedly warned the West that sanctions will backfire and “boomerang” back onto the economies that impose them. This is a big concern in Europe already suffering from feeble economic growth and the prospects of a cold winter if Russia decides to cut off its supply of gas. But the leading edge of this boomerang-effect is, so far, in space. In retaliation for Western sanctions, Russia is ending space cooperation with the US – a cornerstone of the post-Cold War order. After announcing Russia’s planned pull-out from the ISS, Russia has threatened to stop transporting astronauts (and of course, equipment) to the International Space Station. The Russian countermeasures are forcing NASA and its private sector partners to embrace more risk in order to move ahead with programs. NASA’s decision to transport a 3Dprinter to the space station isn’t related to any international friction. But the US decision does open a new vista of options for how to get specific tools to the ISS, which otherwise would rely on transportation, potentially by Russians. For more, watch a video of the company enabling the project. In the process of this undertaking, the US will probably learn a lot about the possibilities of remote manufacturing. This could have a profound impact on the way people on earth acquire goods. It could speed up the disruption of supply chains and allow industries and communities on Earth to flourish in ways impossibly only a few years ago. And so the availability of technology is not enough to make progress occur. There need to be external pressures. Needs for tools in space, weapons in Russian armaments, and of course lingerie on models.